If you haven’t had a chance to read our original Breaking the Bowl post, please consider taking a few minutes to get caught up on the current culture of discrimination that exists for women in country music. First things first, we’re pretty much nearing the end of the time that we plan to give good ol’ Keith Hill, on this site or others. His stories have played a prominent role in helping us answer one of our most persistent questions, “How did we get here?” As such, the information he has provided to date has occasionally proven useful. WOMAN, and countless others, asked Keith Hill for data to prove his assertion that “women were bad for ratings” and we’ve frequently followed the many ways he has dodged those questions across social media. Not satisfied with his claims of “proprietary data that can’t be shared publicly”, we asked if anyone had data they could share that would support his statements. Well, ask and you shall receive. Over the past couple of months, Keith Hill has slowly suggested a myriad of places that would have data to show why women shouldn’t be played: All Access, Coleman, Edison Research, Harkin, Mediabase, Media Monitors, MScore, Nielsen, and more. So, we checked with them. Edison was asked and didn’t have data to support it. Harkin wanted to set up a call to see if we’d invest in a study, so we can only guess that they weren’t sitting on something definitive. Man, we were striking out all over the place. For all of Keith Hill’s assurances, we couldn’t find a single company who would confirm that they had data tying listener tune out to the gender of the artist being played on air. In the spirit of full transparency, we weren’t thrilled with the line “generally not what you are going to want to hear...” To be clear, WOMAN isn’t looking for data to support any particular position. We are looking for data that is accurate, available for review, and applicable to the current culture of country music. That being said, this was the first time that anyone had provided any kind of tangible report for us to review. Any indication that there might actually be a ratings problem as a result of playing women is critical to understanding our current culture. Naturally, we dove right in. Before we begin, we want to be fair and reiterate what Coleman Insights touched on in their email: the report was delivered in 2007 after the research was conducted in 2006. That means the information provided is over a decade old. Obviously, that is not ideal for anyone’s purposes. That being said, if this report comes to mind when a research company is asked if women are problematic for country radio’s ratings, we are interested. Certainly since it is still made available to the public, for free, on Coleman’s website. Even more so, since we would come to learn that it had been presented at our favorite industry “educational” event, Country Radio Seminar. Mostly, though, we were fascinated by the fact that it was released as a joint partnership between Coleman Insights, MediaMonitors, and Nielsen - the latter of which had both previously said they didn’t have data to support claims that women don’t want to hear women or that people tune out of radio because of the gender of the artist being played. Again, we were undoubtedly intrigued by this report. We became slightly less intrigued on Page 1. Again, PPM technology is now largely accepted in the industry and considered to be the leading device for listener insights, but this study - that is still available as a source for citing women’s effect on radio’s audiences - was conducted in 2006 using technology not yet widely implemented. While we think concerns about early PPM technology are valid, we were prepared to set them aside and continue reading with an open mind. The premise of the report: How does the music of a station impact the size of the audience? Specifically, new music. Alright, alright, alright. This might actually end up being helpful after all. We did find it interesting that it said that, at the time, there was “little real understanding of the impact on audience sizes by songs”. 2006 was approximately ten years post-Keith Hill’s late ‘90s “Me and Moon” experiment. Are they, gasp, confirming that we didn’t actually know much about how certain songs, and certainly how the gender of the artist performing said songs, impacted audience sizes? Imagine our surprise. 1,017 songs that somehow became 47? THIS is what someone sends out when asked if they have any information about whether the women of country music are bad for ratings? We thought we might be looking at a multi-market, long-term, deep-dive study into listener habits and preferences. One market? One station? Not even all stations in that market? No other markets or regions compared? Less than 50 total songs? This is it?! We were struck by the statement that these findings “supports the general finding of earlier research in Country radio that male artists are more readily embraced by the audience than female artists.” To date, we’ve routinely asked if anyone had data to support findings that women don’t want to hear women and haven’t been given anything to review. To our surprise, it seems like this report might be prepared to cover a lot of critical ground in the conversation surrounding women in country music. We were also immediately interested in how the two bullet points worked together. It seemed to imply that men outperformed women overall, but that new male artists performed only slightly better than new female artists. That piqued our interest because this report was conducted 10 years after Keith Hill and crew began advising radio stations that the way to improve ratings was to reduce the number of women being played. Could it be that the difference between new artists was much smaller and only grew larger as established artists were factored in because less women were considered to be “established artists” by 2006? There it is again. Male artists perform better than female artists. Right there in black, white, and bold. Why haven’t people sent this report to us before now? It seems, based on these strong statements, that there must have been data, at least in 2006, to support the idea that women prefer listening to men. As we were now in the most detailed sections of the report, we checked for a citation to verify where we might find those “earlier reports” so we could study their information and findings too. There wasn’t a citation. There wasn’t a footnote. There wasn’t anything connecting those statements to further insights within this study or other studies. Did they really just drop in a completely subjective, and arguably sexist, statement right in the middle of this research report? “What many Country program directors have known for some time…” Which ones? Keith Hill? The “affiliation is very strong between female consumers and male artists…” Well, how many females were studied? Did they say they felt a strong affiliation for the men over the women? Surely, somewhere in this report, those statements about ingrained bias could be tracked back to some real data? Surely, somewhere in this report, it would tell us the breakdown of the reporting audience so we could see how many women weighed in? Surely, somewhere in this study, the PPM participants reported the exact reasons why they tuned out of a particular song so we could know that it was due to the artist’s gender? Fair point. After reading the Key Findings above, and seeing the difference between how new and established artists performed, and having skimmed over the table in the Appendix section that showed the artists and songs selected while looking for those citations about “what programmers have known”, we decided to stop and spend some dedicated time reviewing the 47 songs studied. For those counting, that is 29 male artists/bands and only 7 solo female artists. Clearly women were not represented equally. They didn’t make up half of the artists selected. They didn’t even make up a quarter of the artists selected. How could a finding be made that one gender outperformed another when so few women were selected overall? When discussing gender, the report clarifies several times that men outperforming women “is less noticeable when comparing new male artists to new female artists.” We took a look at the songs selected and compiled a list of the artists and the years that they had their first song chart on Billboard’s Hot Country Songs. Not only were women drastically under-represented in the study overall, from our perspective, only one woman in the data set could have been considered “established” in 2006. That makes the statement that new males perform only slightly better very important. In the Key Findings section, the report says, “the audience for established artists grows an average of 3.7%, whereas for newer artists the audience is basically flat at -0.2%.” Basically flat. You might be wondering from our earlier list above, what happened to Taylor Swift and Kellie Picker? Well, they were such new artists in 2006 that their songs didn’t actually peak on Billboard’s Hot Country Songs Chart until 2007- after the study had been completed. So, it likely wouldn’t be out of line to speculate that the “slight difference” between the new male artists and new female artists might have had something to do with the fact that 2 out of 6 of the songs by women were so new (both from a single/song perspective and in terms of the artists’ name recognition) that the audience simply didn’t have a chance to really engage or invest in them before the study was completed. Which is a shame, really, since both Tim McGraw (Swift) and Red High Heels (Pickler) ended up becoming Top 15 hits. At this point, it’s hard for us not to just throw this study in the trash. Not for its other insights into audience reactions to new songs overall, or songs cycles, or audience growth during new songs, or the lack of audience decrease when playing new artists, but for its disproportional data and seemingly unsupported statements in regards to gender. No surprises there. Up-tempo songs frequently perform better than slow songs. What was surprising was that study showed how each song was coded. 9 up-tempo songs were included. All 9 were by men. No up-tempo songs by women were even included for the audience to react to in a report that went on to definitively say that audiences tend to prefer up-tempo songs. After reviewing this report, those excuses almost seem like they have been lifted directly from these pages. This section above is, perhaps, the most important of the entire report because the highlighted portion in the third paragraph is pretty much our current reality. 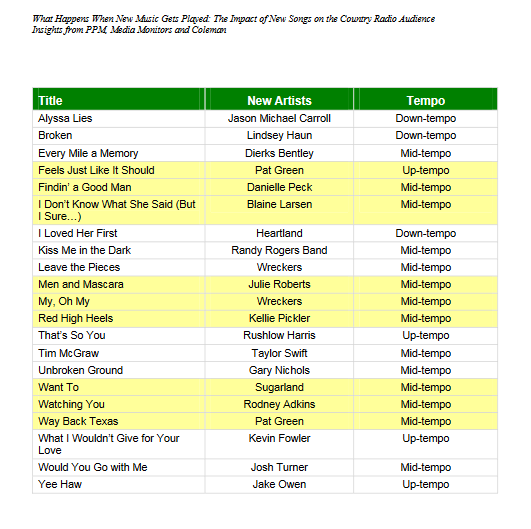 When writing this, Coleman Insights almost incredulously says, “Imagine a station that plays only established, male and up-tempo songs.” Oh, hello, current Country radio. First, it is worth remembering that we feel their conclusions on gender were based on a fairly appalling data set. As such, we think its unfair to continue to reference women here. Beyond that, there are real concerns that country radio stopped responding to its “market” years ago. Listeners and fans tell us ALL THE TIME that they have simply given up on terrestrial country radio. They tell us frequently that the country stations in their area started playing mostly established, male, up-tempo songs and so they started tuning out. The problem is that no suitable alternative within mainstream radio seems to have emerged. Year after year, country radio has doubled down on its “bro country”, “we play the hits”, “women don’t want to hear women” formula. Even streaming and satellite options base their playlists around formulas and algorithms that support the status quo. Between 2004 and 2006 (the year of the study), LeAnn Rimes, Faith Hill, Sara Evans, Reba, Martina McBride, Shania Twain, SheDaisy, the Dixie Chicks, Trisha Yearwood, Jamie O’Neal, Jo Dee Messina, Gretchen Wilson, Terri Clark, and more all had songs on Billboard’s Top 60 Hot Country Songs Year End charts. It’s worth mentioning that the study makes no allowances for having not selected more of these well-known and established female artists of the time. We speculate that it’s quite possible listeners would have remained engaged in higher rates had songs like Faith Hill’s Mississippi Girl or Jo Dee Messina’s My Give A Damn is Busted been studied. Today, women make up about 8% of some stations’ entire playlists- current, recurrent, and gold. Not 8% of each category. 8% of the entire playlist. The other 92% undoubtedly sounds so similar that it would drive away anyone looking for that more diverse option. From our experience, those people are turning to their own playlists and purchases, thus shrinking radio’s existing market into what has become a small, homogeneous, circular sounding board. Well, someone call up Keith Hill. Actually, call up every country radio station you can find. We live in an established, male, up-tempo world that seems to be trying to solve a ratings problem that probably has more to do with a station’s overall brand than it does listeners wanting to hear more from the boys. Why? We speculate it has a lot to do with those PDs/MDs returning back to those same station managers after CRS. Anyone who has ever walked into a radio station knows that money is tight. More so, “branding”, and especially “re-branding”, is expensive. Does the station need better production? Newer equipment? More staff training? A boost in the tower signal? Better promo items? More interesting giveaways? A logo that doesn’t look like it came from 1972? On-air shifts that aren’t voice-tracked all but one daypart? All those things come at a cost. Yet, those things make up a station’s overall brand. Want know who else isn’t readily telling station managers to work on their branding? Consultants. Stations pay for consultants to come in and tell them how to MAKE more money- not spend more. As such, consultants seem to spend more time tinkering with the playlists or giving motivational staff speeches instead. So, no. The most cash-strapped areas of our industry probably didn’t focus a lot of time on station branding which takes increased amounts of consciousness, creativity, consistency, and often, cash. Instead, we probably just ended up playing less women and slow songs. Coleman continued its warnings saying that there was a “need for more research” and “it is possible that in Houston the reaction to new music is entirely different for KKBQ or KTHT than it is for KILT”. Color us shocked. We’ve asked for “further research” for months now and this report, even with its problematic data set, is the first we’ve seen. We can only assume no one ever got around to funding that further research. We’re also guessing that’s why so much of the country radio audience doesn’t feel particularly well-served. So, now we want to talk to all of you - those who make up "The Bowl" of country music. We've talked about the past 20 years. The 10%. #Tomatogate. The careers cut in half. All that is on you. You broke "The Bowl" by allowing it to persist. But, it's time now to fix it and move forward. Who forgot to check that the data set only included 7 women? Who glossed over the fact that only 1 established female was studied? Who approved a CRS session with bullet points that said women performed worse than men? We have looked through many reports to date and the idea that one race, religion, or sexual orientation would be preferred over another has never come up. Why? Even if data did support it, the result would likely highlight an unflattering and troubling bias among the audience. If statements like the above ever made it into print, they would undoubtedly come with a recommendation that more needs to be done to encourage listeners to expand their preferences or for stations to expose their audiences to a broader array of talent to assuage their bias. This industry, for all its shortcomings, still probably wouldn’t report racism, homophobia, or religious intolerance as an acceptable fact. Companies would fear backlash. Rightfully so. If any of the above were reported on the slides of a PowerPoint advising PDs at a large industry event, companies would expect the public’s response to be strong and swift. The industry would expect others to challenge their assertions and question the ethics of reporting on such things. The Country Music Industry, “The Bowl”, didn’t and doesn’t seem to feel bad repeatedly reporting these things about women though. We can only assume that’s because a) they believe them to be true and b) they don’t anticipate backlash. After all, it just confirms “what programmers have long known”, right? Country music should feel bad, though. Certainly for the many social and generational implications that come with wide-spread gender discrimination. But, at a more basic level, it should simply feel sheepish that it might have been basing much if its decision-making around gender on the observational “Me and Moon” approach of the late 1990s or this list of 47 songs which mostly included only a small handful of females who were relatively unknown at the time. Find a programmer who would agree that a solid conclusion about gender preferences could be made between 2006 George Strait (two years after releasing his 50 Numbers Ones album) and 2006 Lindsey Haun. More than that, The Bowl” should move to rectify the 20-year long practice of diminishing women based on somewhat shady studies. Primarily because the notion that someone can prove that listeners tune out because they don’t like the gender of the artist being played simply can’t be supported by the technology available. Not in 2006 and not now in 2018. Right now, things aren’t getting better, but they can. And the reasons to see change are as worthwhile, if not exponentially more significant, than any of the shady studies and sexist beliefs that have gotten us here so far. “The Bowl” is still very broken, but it is only a few patches of progress away from being back on a better path. Who is willing to take those first steps to finally see this culture change through?